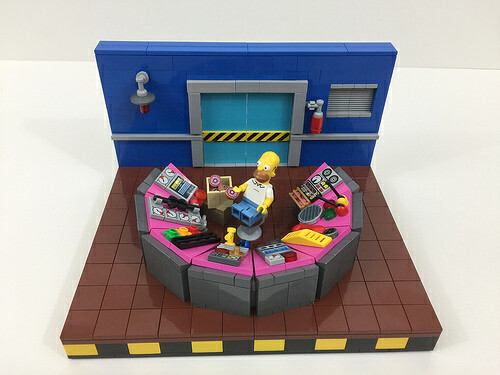 Homer Simpson’s hard at “work” in Chris Adams perfect vignette of Sector 7G of the Springfield nuclear powerplant. The vibrant colors of the cartoon have been brought to life with LEGOs brilliant pastel colors – it looks just like the real thing. Simple yet sophisticated, the little touches like the box of donuts and the fire extinguisher all help to complete the scene. The control panel with its levers, dials and even a telephone looks great and I love how Chris has used the yellow and black bricked platform to mimic the lines on the security doors.